Conroe Movers are one of the first companies to add green practices to our services. We are proud to say our green methods of bio diesel trucks and bio degradable packing materials make us leaders in the moving industry. Bio diesel fuel will cut down on emissions and other environmental problems. Houston Movers believe your move should be hassle free, safe and green. Our company has a proven track record of successfully moving homeowners and businesses all over the state and country. We are staffed with top notch professionals with many years of experience in the moving and transportation industry. We are trained in the latest moving techniques and work with the most state of the art equipment. We will go the extra mile to ensure your belongings are protected and safe during your move. Our recycled packing materials will cut down on wasting and time. We will supply you with our packing material and boxes up to one month prior to your actual relocation date. You will need to allow plenty of time for packing and getting your belongings in order. Our customer service will be more than happy to advise you on the best way to pack your inventory. For your convenience, we will pack and unpack any home or business. Our professional packing team will efficiently take care of your values and keep everything safe from damage. We are specialized in packing fine art, collectibles and fragile items in your home or business. If you need to move at the last minute, contact our customer service for a free quote at the form above. Our company was established in 2011 in south-west houston. We initially began with two trucks and 3 moving crews. 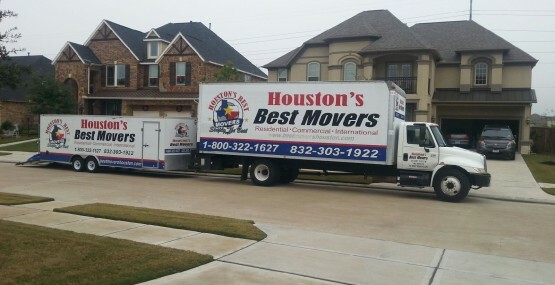 Today we are one of the fastest growing moving companies in the Houston metro area with 12 moving crews and a fleet of professional moving trucks. We had invested in the most advanced moving equipment knowing that our customers belongings are treated as it was our own. We are commited to provide excellent moving service to all of our customers. Moving day is a stressful event and we will do our utmost to make it as easy and smoothly as possible for you. Eventually our care and quality for our guests led us into more conscious behaviors. One day we sat down and thought about how to convert the entire company into a more contributive company. We realized at this time by adopting greener methods and reducing our carbon footprint that we could truly sleep easier at night. This leads to en environment in which we can all enjoy. Know you are siding with us is siding with the planet and a greener earth. When Tom told me they will pack, load and move us on the same day I was skeptical at best as it took previous movers almost two days but it surely was a good surprise to have it all done in one day… Amazing. I called these guys last minute and they worked with me to get me moved across the city in few days. I couldn’t have asked for better help.